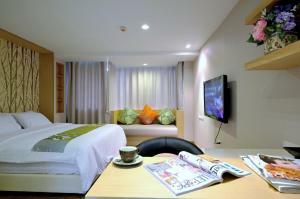 Stay at a modern, boutique style room with free Wi-Fi at Nantra Retreat and Spa. Set in Bangkok’s business district, Nantra is a 7-minute drive from Thonglor Skytrain Station and offers a coffee shop overlooking an outdoor pool. Walk on wood panelled floors as you step into your spacious room, which feature soothing tones. 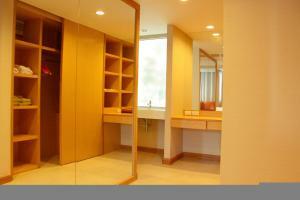 A private bathroom boasts a spa bath and separate rainshower. 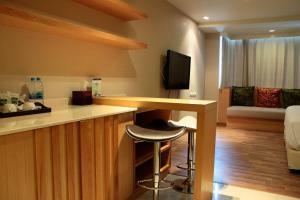 Watch satellite channels on a flat-screen TV or utilise the tea/coffee making facilities and minibar. A 2-minute drive away is a 24-hour convenience store, while Emporium Shopping mall is a 15-minute drive from Nantra Retreat and Spa. Suvarnnabhumi International Airport is approximately 30 km away. Relax with a massage or work-out at Nantra’s fitness centre. Limousine and laundry services are available at an extra charge. An American breakfast is served at the Coffee Shop. 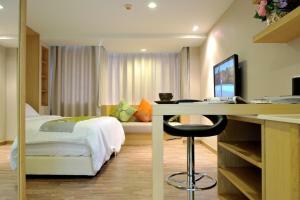 Features free Wi-Fi, a flat-screen satellite TV, private bathroom with rainshower. 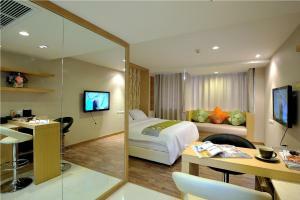 Rate: THB 1575.00; select dates below to get current rates.